Get Control Of Your Power Vampires! As many of your may know, almost everything that is plugged into the wall today uses some electricity. We have those small square and rectangular devices that plug into an AC outlet and look like "warts" on the wall, "wall warts". We have cell phone rechargers, VCRs, DVD player/recorders, and Digital receivers recorders. Then there are microwave and regular ovens, coffee makers, & other kitchen devices. If it has a clock, has memories, or uses a remote control it uses electricity even when off. Some of these devices don't really need to be on all the time. A TV or a stereo radio for example, yes it is nice to be able to turn them on using a remote, but generally speaking if I'm ready to watch TV or listen to the radio I can first turn the TV or radio on and then use its remote, if any of these devices had real on-off switches. Also, don't think that because you use a "clapper", or similar device, to turn the AC off to another device, you're saving electricity. The "clapper", or similar device, uses electricity all the time, so you've just moved from one power vampire to another. Most of these devices have no way to really turn them off other than unplugging them, so, what is a person to do? One possibility is to put switches on all AC outlets in the house, or at least all that you use for these kinds of devices. Another would be to buy extension cords with on-off switches to cut power to the device. While both of these will work, I've only bothered with the latter. Now, if I'm going to build a home I'd consider some inclusion of on-off switches to at least one AC outlet per wall plate for most of the areas, especially areas where I know I'll be using units, wall warts, or rechargers for devices I'll want to turn off. It seems rather problematic to have these kinds of extension cords plugged in wherever we would need to turn a wall wart or some other device off. It would not be good to have certain devices really off, the coffee maker that has the coffee ready when we wake up or the VCR/DVD recorder that's going to record a show for us two days from now for instance, but the bread maker, that we only use once a week or once a month doesn't need to be plugged in all the time. If it is not too much of a bother then keep the device unplugged until you need it. Yes it is nice to know when the bread is going to be done, but a relative timer would have been just as useful, one that tells us how much time is left until the bread is done rather than a "real" clock that has to be reset every time it looses power to tell us the time of day when the bread will be done. In this case the unit could have a real on-off switch and not cause any problems such as having to reset the clock every time you plug it in. I just leave the bread maker unplugged and then when I want it I plug it in. Thankfully it is easy to set the clock so I do that, but since I'm only using it once I do not bother with the AM/PM indicator since generally it does not matter. 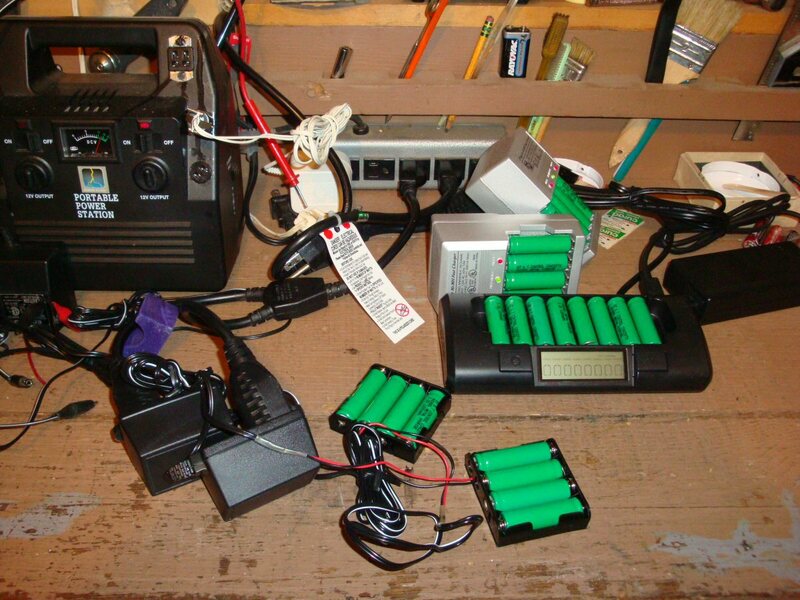 I realized after evaluating my use of rechargers that I could consolidate the location for a good many of my rechargers and wall warts in my radio shack. 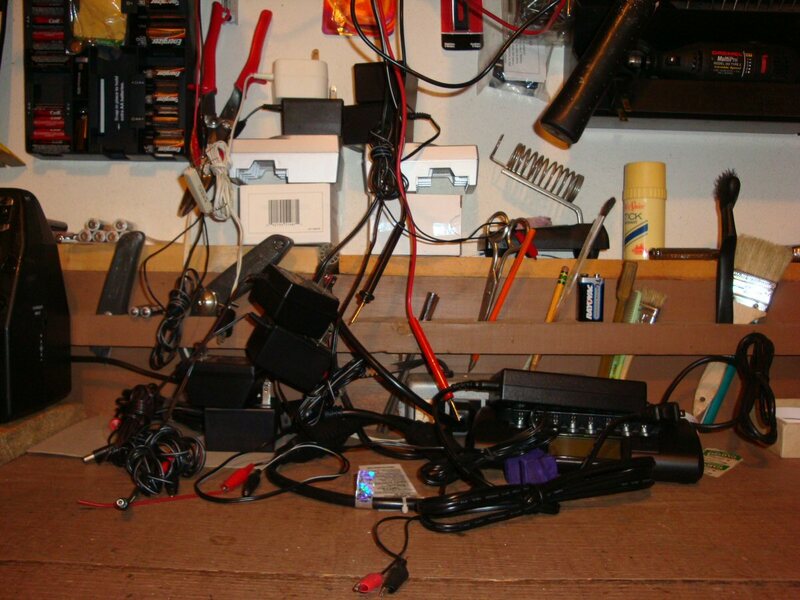 I ended up having so many wall warts & other power vampires that they were always falling all over the place (see Photo A) and then when I was recharging almost everything at once it was an even bigger mess and I couldn't use the work bench easily, see Photo B. About a year or so ago we had replaced almost every wall outlet and light switch in our kitchen while doing some remodeling. None of these outlets and switches were bad, only dirty, which a little cleaning with an old tooth brush and plain water took care of. 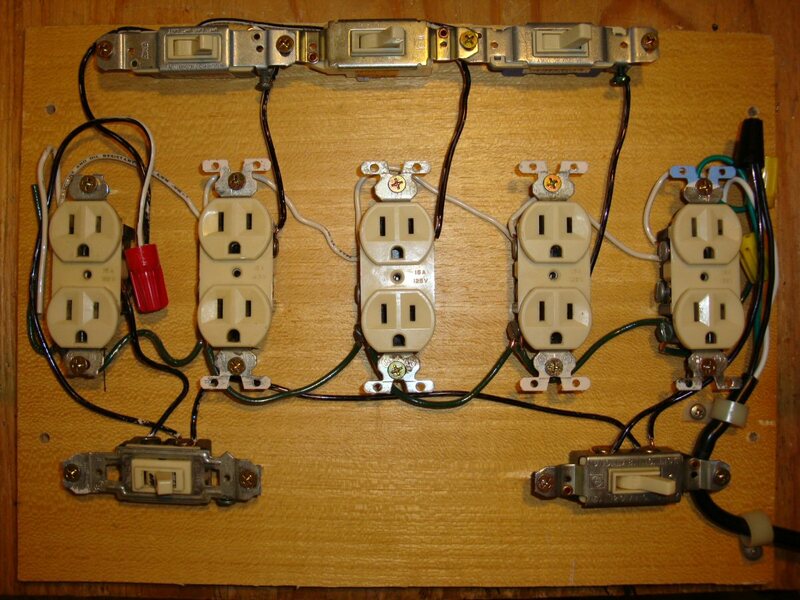 These extra outlets and switches led me to the idea of building a "Power Distribution Center" (PDC) to control all the power vampires I used in or near the radio shack. Since I had everything I needed in my junk box there was no cost at all. If you have to buy the switches, outlets, and wall plates you're probably looking at a cost still probably under $10. Assuming you have the wood for the base and the wire. The idea was a PDC with five outlets and five switches which could then distribute power to up to ten devices and turn off two at a time. My first attempt worked but I had forgotten to take into account the size of some of the wall warts and when I plugged them in I could not gain access to the on-off switch for that outlet pair. I took it apart and mounted the outlets and switches onto a larger base, see Photo C.
I then made sure everything fit by testing with a few larger wall warts. The outlets were positioned so that the wall plates made it impossible to get a finger on to a hot screw. A bit more protection for some of the switches and one set of outlets was needed. To complete the protection I added some molding close to the hot side of the right hand outlets and to the top side of the three top switches. The bottom side is only the ground connection on the switches so they are safe to touch. If you look closely you'll see that I also added a small shelf to the top so I could place unused wall warts on it, see Photo D.
The last photo is of the unit in action and the whole work bench when I'm recharging almost everything, see Photo E.
This has made a very nice difference in the work area and ability to use only those devices I need at any time and all the others can be turned off, thus controlling some of the Power Vampires in the house! 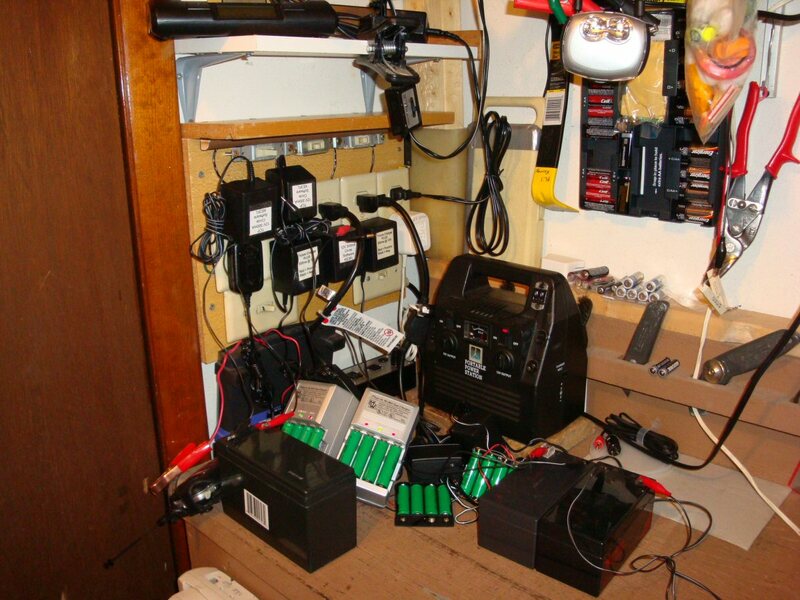 - If you are not really knowledgeable about how to wire outlets and switches use a battery and voltmeter to test your connections first. Be very sure you have covered all hot screws, the screws carrying the active AC voltage and power, so that they can not be touched accidentally or on purpose by a child. 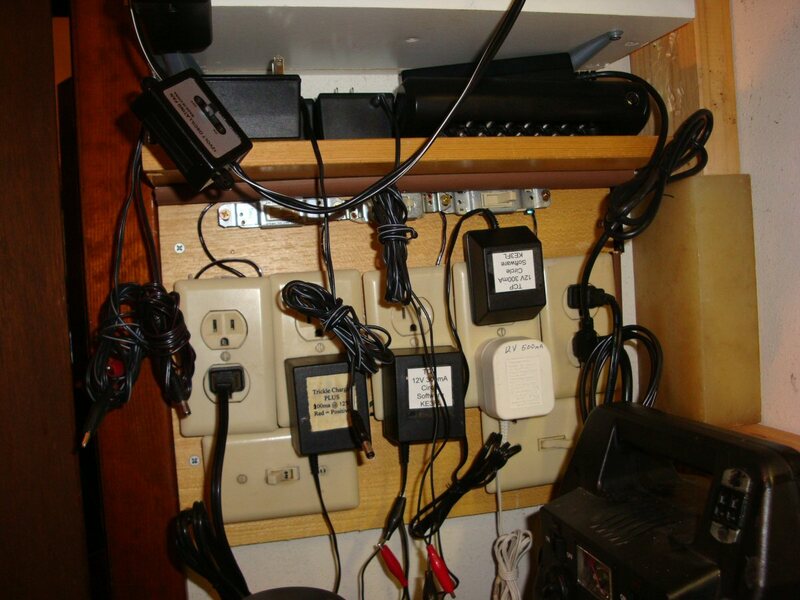 This can be done in one of two ways, build a wall around and in the front of the entire PDC, or by putting walls, shelves, or wall plates on the outlets and switches and arranging them in such a way that all hot connections are covered or well back from openings that little fingers and screw drivers could get into. I also suggest that you buy an AC outlet tester so you can make sure you wired the outlets correctly. - For added safety either plug the PDC into a ground fault circuit interrupter (GFCI) or build one GFIC into the PDC and feed all others off it so that as they are turned on all current goes through the GFCI and thus any current NOT going back through the GFCI will cause it to pop off. Also, while you can use a switch to break either the hot wire or the return wire to open the circuit, it is ALWAYS recommended to break the hot-wire connection so that the outlet is completely dead when turned off. This will protect that inquisitive child who plugs something into the turned off outlet. I used a three wire plug-cable I had from a defunct piece of equipment to get power to my PDC. This center is for wall warts and other Power Vampires using low current NOT for large TVs, Radios, tools, and other power hungry appliances. Last, remember if you're plugging this PDC into an outlet on your wall or work bench the outlet is probably one of a few on a circuit breaker of only 15 Amps so the entire circuit of a number of outlets, each of two sockets, is only designed to handle 15 Amps, and if there are other devices that are plugged into these outlets you need to figure their power usage into the overall usage of the circuit so that you don't end up popping your circuit breaker, or worse, NOT popping it when it's over loaded, each time the PDC is used.